EpSBS is a Peer-Reviewed Conference Proceedings Journal. Peer Review is a process that EpSBS use to ensure the articles which EpSBS & Future Academy publish represent the best scholarship currently available. When an article is submitted to the EpSBS, the volume editors required to send it out to other scholars in the same field (the author's peers) to get their opinion on the quality of the scholarship, if its relevance to the field, and if its appropriateness for the conference proceedings. 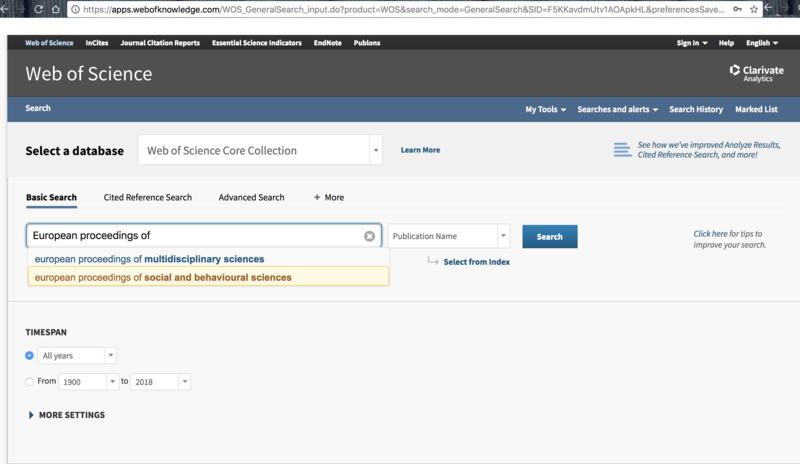 European Proceedings of Social and Behavioural Sciences EpSBS Volumes either have been indexed or accepted or submitted in Web of Science WOS Clarivate ISI Conference Proceedings Citation Index (ISI CPCI). EpSBS partners with relevant scientific databases to enable researchers to find the papers in the EpSBS easily. The databases that abstract and index these papers include CrossRef, EBSCOhost Electronic Journals Service (EJS) and EBSCO A-to-Z Knowledgebase. EEIA 2018 - International Conference "Education Environment for the Information Age"
EEIA 2017 - International Conference "Education Environment for the Information Age"
GCPMED 2018 - International Scientific Conference "Global Challenges and Prospects of the Modern Economic Development"
CIEDR 2018 - The International Scientific and Practical Conference "Contemporary Issues of Economic Development of Russia: Challenges and Opportunities"
Each conference proceedings must be submitted to Web of Science WOS Clarivate ISI Conference Proceedings Citation Index (ISI CPCI) for approval. Past and future volumes of EpSBS will be submitted to Thomson Reuters for inclusion in its index.